Kim Churches, CEO of the AAUW, says salary transparency is key if we want to end the need to commemorate Equal Pay Day every year. For many of us, the idea of talking about how much we earn has been off limits. Like our age, weight or the amount of money in our 401(k)s, money has traditionally been one of those topics people simply are reluctant to discuss. But that culture of secrecy has shifted in recent years—and that’s something to celebrate as we mark Equal Pay Day, the day that symbolizes how long into the calendar year women have to work to earn as much as men did the previous year. One reason the pay gap has persisted for so long is because discrepancies in salaries can be difficult to detect. If people aren’t aware of who’s making what, it’s hard to know when someone—a woman, for example—is being shortchanged. Consistently, research shows that when employers are transparent about salaries, the pay gap narrows. In public-sector and union jobs, for example, the difference in pay between men and women tends to be lower because their salaries are public and people can find out what their equivalent titles and positions pay. 1. Secrecy practices are changing. Many employers have long had policies that discourage employees from openly discussing salaries and, in some cases, even penalize workers for doing so. And, in many states, policies supported this. Slowly but surely, these are going by the wayside: Laws in 18 states and Washington, D.C. explicitly ban employers from prohibiting salary discussions. (And the proposed Paycheck Fairness Act would make it illegal nationwide.) Even absent legislation, some employers are abandoning these policies voluntarily because they realize transparency can make workers happier and more productive—and that ultimately enhances their bottom line. 2. Workers are getting smart during negotiation. In the same way consumers are gravitating to automobile and real estate websites to learn more about the price of a car or a condo, sites like Salary.com and PayScale.com are arming job candidates with the information they need to negotiate fair salaries. These sites allow people to research pay based on geographic region, job title, experience, etc. To learn more about how to use these (and other) tools to research salaries – and to apply that information when hunting for a job or asking for a raise—check out AAUW’s Work Smart Online. 3. Employers are becoming more transparent. It’s still not widespread, but certain companies –Whole Foods, for example – allow employees to find out what their co-workers are making. Other employers share “salary bands,” so their workers can know the compensation range for a particular position. Less formally, HR professionals will, when asked, tell workers the pay scale for a particular role, or at least share the factors the company uses to make their salary determinations. Still, we need strong laws to ensure everyone in the U.S. workforce can benefit: Sunshine is the best disinfectant when it comes to closing the gender wage gap. One of the most encouraging trends I’ve observed is that today’s workers seem happy—even eager—to share salary information with one another. (But before doing so, I encourage people to know their rights by looking at their state laws and reviewing their employee handbooks to make sure they’re not running afoul of their employer’s practices.) Though this may feel initially awkward, saying something to a colleague like “In reviewing my skills and experience, I’m concerned I may be underpaid in my current role. Can we discuss the salary range for this position?” can make the conversation seem less personal and prying. We’re also seeing evidence that with generational and demographic changes in the workplace, more workers are willingly sharing salary information online. Last summer, for example, an anonymous Google doc made the rounds in Hollywood in an effort to bring transparency to the going rates for television writers, actors and crew members. In addition to stronger policies at the state and federal level, conversations like these, whether virtual or in real life, are essential if we want to end the need to commemorate Equal Pay Day every year. The more information we have about how jobs are valued – and how different people are being paid – the closer we will come to making sure that equal pay for equal work is the way of the world. 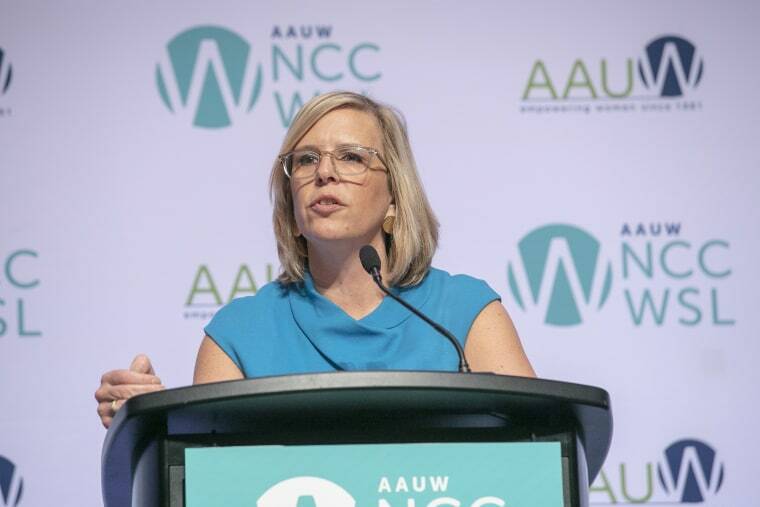 Kim Churches is the CEO of the American Association of University Women, a national non-partisan nonprofit that works to advance gender equity for women and girls through research, education and advocacy.